Pinnacle Complete Detailing Wax & Cleaning Kit- Pinnacle Ultra Poly Clay, Souveran Wax, Bodywork Shampoo, Paintwork Cleansing Lotion, and more! Take your vehicle's paint finish from needing attention to the center of attention! The Pinnacle Complete Detailing Wax & Cleaning Kit is the best combination of Pinnacle products ever offered! The kit contains everything you need to create a flawless finish, including our signature wax, Pinnacle Souverän. 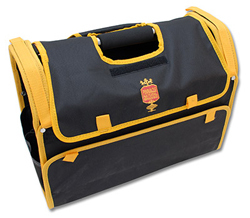 This huge kit is available at an excellent savings off the regular retail price. 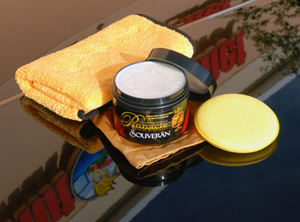 Souverän™ is a hand-poured wax designed to produce the deepest wet-look shine possible in a paste wax. It is a special blend of Brazilian Ivory Carnauba and natural oils which produces tremendous depth and richness. 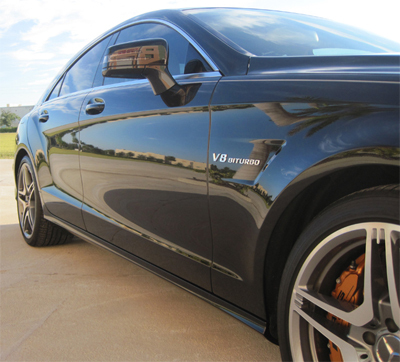 The easy-on, easy-off formula makes waxing your vehicle as enjoyable as it is beneficial. Pinnacle Bodywork Shampoo has the smooth, silky feel and aroma of a luxury body gel. As you wash, natural coconut oils attach to surface dirt. These oils act as a lubricant. Sand and abrasive grit slide off in the rinse water without scratching the surface. New Improved Formula! Pinnacle Bodywork Shampoo now contains Tuff Suds ®.New technology uses cleaners suspended in the bubble's walls to scour away tough dirt and grime. Most important, the suds last! No more flat suds water before the job is done! Applied prior to waxing, Paintwork Cleansing Lotion will restore and preserve your car’s original beauty using d-Limonene, a natural cleaner made from the rind of oranges, along with lemon oil, natural clays and sea kelp to polish without abrasives. Use Crystal Mist after washing or anytime to bring back that just-waxed shimmer. Crystal Mist is a blend of super-refined, brazilian Ivory Carnauba, conditioning oils, and crystalline polymers. More than a quick detailer, this spray carnauba will add an additional layer of glossy protection. This new ultra fine grade of clay removes paint contamination without the possibility of over-use or dulling the paint. Use Ultra Poly Clay as often as needed to maintain a slick, smooth finish. This is an ultra safe, nonabrasive grade of clay that works on all types of paint, glass, and chrome. Use Pinnacle Clay Lubricant to provide excellent lubrication and surface protection as you clay. To use Pinnacle Ultra PolyClay: After washing and drying your vehicle, mist a 2’ section of paint with the lubricant. Gently rub the clay bar back and forth across the wet area. It will grab at first; this is the bar pulling out contaminants. When the bar glides smoothly, your paint is clean. Move on to the next area. Reform your clay and use a clean portion on each section of paint so as to avoid recontamination. 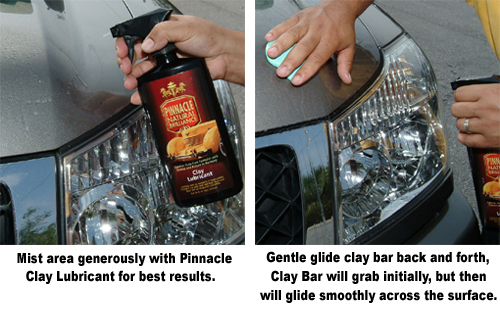 You may also use the Pinnacle Clay Lubricant to clean any residue left by the clay bar.